Christmas blocks are always popular. There are just so many to choose from. Whether you make pieced blocks, applique blocks or mix and match both, the quilts made with this theme are always stunning and unique. 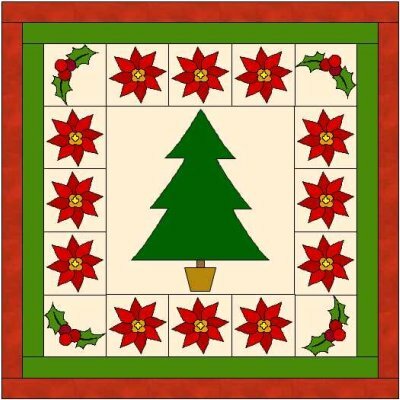 If you can't find enough Christmas blocks for your quilt look at using some traditional blocks and using Christmas fabrics in them. Blocks can also be made using Christmas colors (red, green, gold, silver, white and brown) as opposed to Christmas fabric which can be more expensive. A log cabin block would be very stunning in Christmas colors or fabrics, and it is a relatively quick block to make. Whatever you choose to do have fun! Above is a quilt made up of 3 blocks. There are no instructions for this quilt as I have made it to inspire you. I have designed these blocks and quilts using Electric Quilt 7 (EQ7), a quilting program that I highly recommend. 1. When sewing a block together it is important to use an accurate ¼” seam allowance. In quilting that’s sewing a ‘scant ¼” seam’. This means a seam that is a thread or two less than a true ¼” – these few extra threads are taken up as you fold the fabric back on the seam. You can buy a ¼” foot for your machine which creates a scant ¼” seam when you run the edge of the foot along the edge of the fabric. There are times when it is OK to not use a scant ¼” seam. If you are the only person sewing the quilt then as long as your seams and points are consistent it won’t matter. Your finished quilt may end up slightly smaller or larger but everything will still align properly. 2. Piecing blocks together. Each block is made up of smaller squares, either 9 or 16 squares. Some of these smaller squares need no sewing whereas others consist of two half-square triangles that need to be sewn together to make a small square. When you have the completed number of small squares, sew them together in rows. Finally sew the rows together.